Iconic Canadian brand Tim Hortons continues to evolve and expand its offerings. 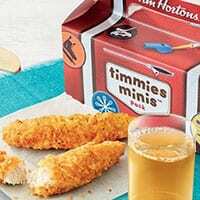 The coffee and food establishment has announced it’s now offering a new Timmies Minis kids menu. The company said the new kids menu offers meal options with no artificial colours or flavours, a full serving of fruit and no added sugar. Chicken Strips, two pieces of seasoned, breaded chicken breast served with sweet and sour sauce. To complement the entrée, kids and parents can choose from apple slices, SunRype FunBites, Black Diamond Cheestrings or snack-sized potato wedges, as a side and white milk, chocolate milk, orange juice, apple juice or a bottle of water as a drink. Tim Hortons also announced it has partnered with Team Canada hockey player Meaghan Mikkelson to launch the new kids menu.